They are hands down the prettiest pair of shoes to ever grace my feet. That's quite a surprise to me considering I'm a heel-a-holic and flats really aren't a common occurrence for me, but they are simply stunning. The combination of creamy pearl, rich metallic gold, and warm tan leather, creates a colour palette reminiscent of delicious melted caramel. If a pair of shoes can make one think about food, they MUST be magical. You can see how I style them in an outfit post over the next couple of days. They look beautiful, they feel beautiful... I'm in such awe of them, they are just too pretty. Hope you're all having a wonderful weekend and of course, wearing lots of beautiful shoes! 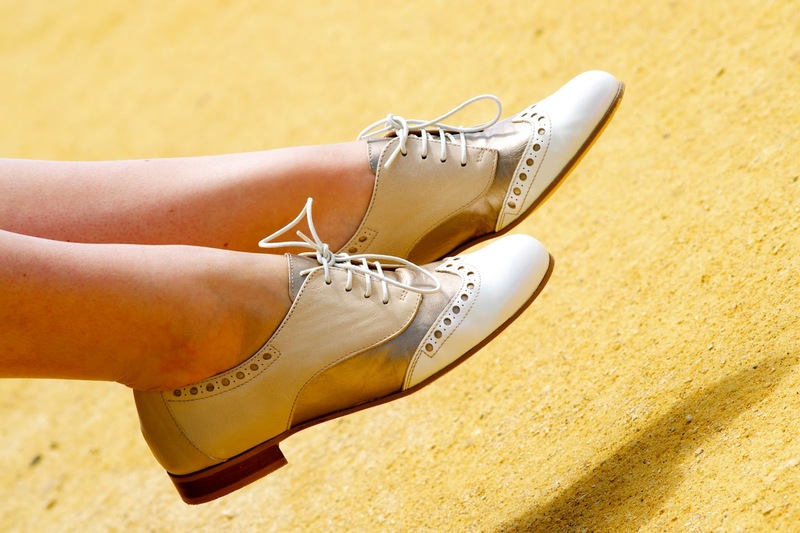 These shoe¨s are so vintage like and original! Loving them! I really love high Heels but this brogues are soooo beautiful!!! !